What plant can be used as an antiseptic, a bedtime snooze inducer, a source for nectar bees use to make honey, a lice and nit treatment AND a good guitar string cleaner? Lavender... and it can do a whole lot more. Latin for lavender is ‘to wash' so it makes sense that this member of the mint family is used in so many health and beauty products to calm and balance the body and mind. Lavender can be used for everything from respiratory infections, high blood pressure, menstrual issues and muscle aches and pains. Lavender essential oil applied to the body with a damp cloth or inhaled on a few drops on a silk scarf can relax the mind and calm the senses, great for those suffering poor circulation, nervous tension or insomnia. Lavender's antiseptic and anti-inflammatory properties help to relieve burns, treat skin conditions (acne, eczema, psoriasis and stretch marks) and irritations (insect bites). It is also useful for digestive issues such as colic, indigestion, vomiting and diarrhea as it increases the mobility of the intestine. 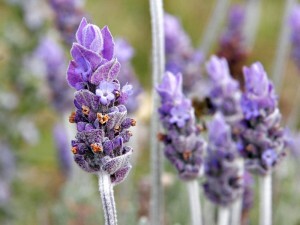 A cautionary note - lavender oil can be a powerful allergen and pregnant or breastfeeding women should avoid ingesting. Always take care to read labels.